German physician and botanist; born in Breslau Dec. 20, 1790; died there July 24, 1856; educated at the medical and surgical college at Breslau, the Ober-Collegium, Berlin, and the universities of Heidelberg and Breslau (M.D. 1813). He practised medicine in Breslau from 1813 to 1816, and in the latter year was appointed privat-docent in pathology at the university of that city. In 1820 Henschel embraced Christianity, and soon after published his first important work, "Von der Sexualität der Pflanzen," which attracted considerable attention in the world of science. He was appointed assistant professor at his alma mater in 1821, and in 1832 professor of anatomy, physiology, and pathology. 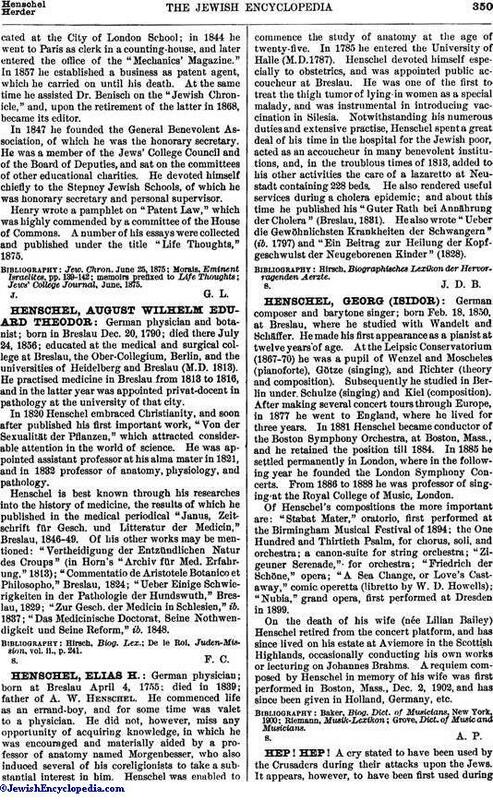 Henschel is best known through his researches into the history of medicine, the results of which he published in the medical periodical "Janus, Zeitschrift für Gesch. und Litteratur der Medicin," Breslau, 1846-49. Of his other works may be mentioned: "Vertheidigung der Entzündlichen Natur des Croups" (in Horn's "Archiv für Med. Erfahrung," 1813); "Commentatio de Aristotele Botanico et Philosopho," Breslau, 1824; "Ueber Einige Schwierigkeiten in der Pathologie der Hundswuth," Breslau, 1829; "Zur Gesch. der Medicin in Schlesien," ib. 1837; "Das Medicinische Doctorat, Seine Nothwendigkeit und Seine Reform," ib. 1848. De le Roi, Juden-Mission, vol. ii., p. 241.